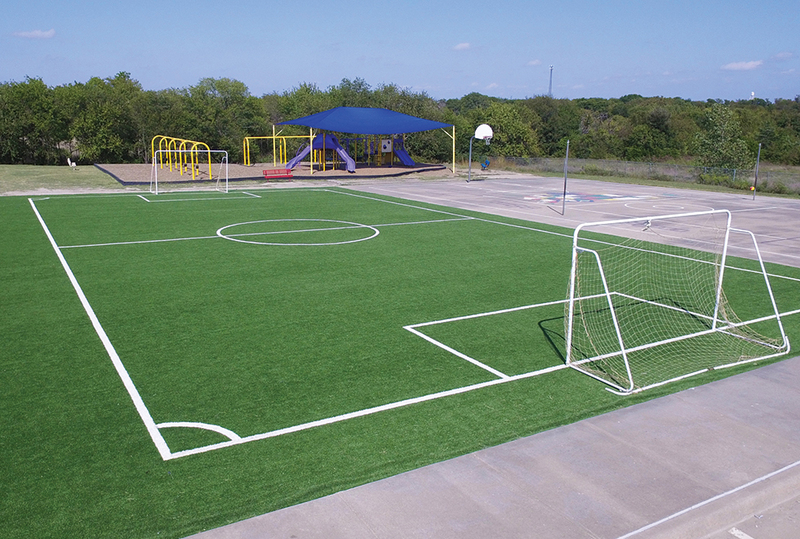 Joe K. Bryant Elementary in Anna ISD has a new Kickabout mini-pitch soccer field play surface built by Hellas Construction. Kids in Anna are racing outside to play on the Kickabout™ field, a new customizable playing surface installed in August at two of the Anna ISD Elementary schools. 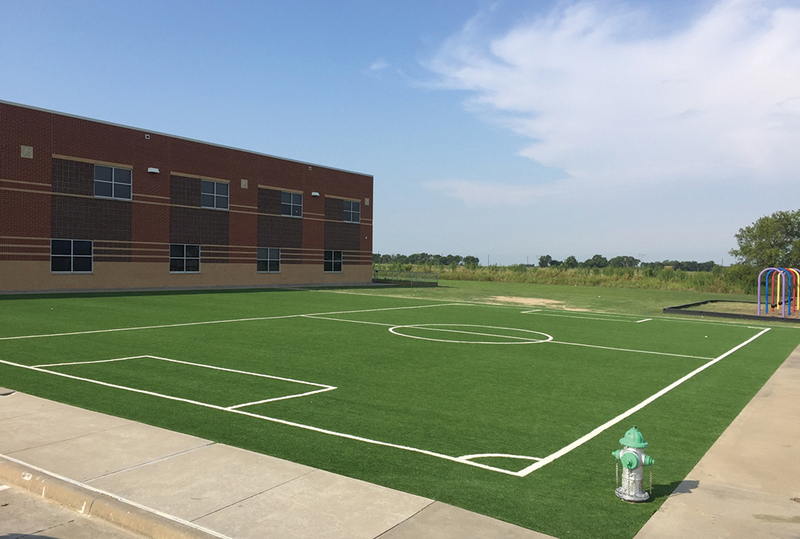 Kickabout from Hellas Construction allows the students at Sue E. Rattan Elementary and Joe K. Bryant Elementary to safely participate in a wide variety of sports or play in any weather. The kids can’t get enough of this fun-packed playground and mini-sports field that combines intelligent design and the best synthetic turf in the industry. “It was very important to us to find a solution for our kids to have the opportunity to play outside as often as possible,” said Pete Slaughter, Superintendent of Anna ISD. The district was unable to keep grass covering the play areas at the two schools. Uneven surfaces covered in rocks and holes, were not easy for the kids to run on. Every time it rained, there was a large amount of mud that had to be cleaned from the students’ shoes before entering the school. This limited the time the kids were able to go outside and be active. “It was money well-spent,” said Slaughter. “There is no maintenance at all, it’s a very durable surface, and it’s safe for our kids,” he said. “We are committed to continue to invest in this product and will place it at every elementary campus we build in the future,” Slaughter said. The Kickabout play surface from Hellas Construction can be built from 2,000 to 20,000 sq. ft. and fits into any existing landscape. Hellas uses its exclusive Matrix® Turf or Grasso® Sportscape, a simple drainage system, and either organic infill or a pea gravel infill. Kickabout brings together a variety of sport or game options like soccer, funnel ball, hopscotch, tetherball, and four square and customizes it into one fun-packed playground and mini-sports field that can be used year-round, even after severe weather, without the worry of potholes, mud, tall grass, or weeds. The Hellas Kickabout will inspire and motivate children to be active everyday and help them reach the 60 minutes of daily activity recommended for optimal adolescent health. Physical activity is an essential component of a healthy lifestyle for everyone, especially children. Today’s youth spend an average of 7.5 hours consuming media daily- watching TV, listening to music, surfing the Web, social networking, playing video games, and decreasingly less time engaging in physical activity. Kickabout elevates the level of any fitness or wellness program, while exciting children and driving them to be more active everyday. Hellas provides this flexible and affordable surface alternative for any schools, daycares, churches or activity centers with limited space or finances. By providing a safe, reliable surface for games, sports, and activities, the Kickabout playing surface will ignite physical education curriculums, making it a great fitness and wellness solution. By providing a safe, reliable surface for games, sports, and activities, the Kickabout playing surface will ignite physical education curriculums, making it a great fitness and wellness solution.